Stay in the Loop: Submit your email address (I won't sell your email, I assure you) and I'll update you on noteworthy events or happenings on EatMoreKale.com. I PROMISE not to overdo it or bug you. Welcome to EATMOREKALE.com. My name is Bo, the “Eat More Kale” guy, Muller-Moore. I’m a t-shirt artist. 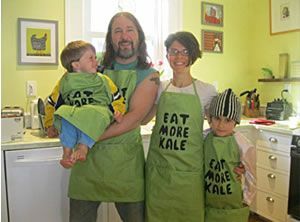 Since 2001 I’ve printed and sold “Eat More Kale” t-shirts far and wide. I’m asked all the time, “Hey Bo what does EAT MORE KALE mean? Well, it means a lot of things to a lot of people. Most obviously, it’s about eating more KALE therefore eating healthier. Eat More Kale is also about supporting small business. For years I was a one man show. My shirts are distinctive, offbeat, one-of-a-kind works of art. I’m happy now to actually employ a handful of local friends to help me keep up with my expanding micro-business. That said, I have no giant call-centers to hide behind and I don’t need them. I am one man, with some good friends who are also handy with squeegees and that’s how I like it. When you see someone wearing one of my t-shirts you will instantly recognize its personal style, character and the care we took to craft it. Eat More Kale is a movement, a t-shirt revolution. OK, that may be an overstatement. 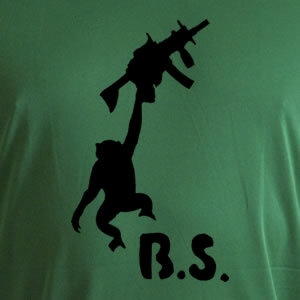 I can assure you though, I don’t know of any other t-shirt design that leads to more fun or more conversations. I’m proud to print Vermont’s One-at-a-time Original Design T-shirts.